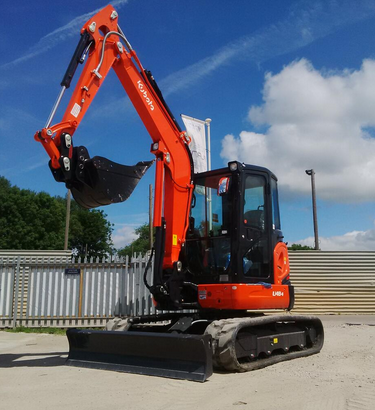 UK’s best selling mini excavator range from KUBOTA Construction Machinery. With over 17 models to choose from including traditional tail swing, reduced tail swing, and zero tail swing. 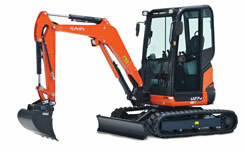 KUBOTA UK were formed in 1979 and based at Thame, Oxfordshire. Kubota (U.K.) Limited is a subsidiary of the Kubota Corporation, which was established in 1890 as a manufacturer of cast-iron water pipes in Osaka, Japan. In the early 1900s, the Kubota Corporation turned its attention towards powered equipment. The tremendous expertise and experience gained over the past century has led to many important product developments, helping reinforce Kubota’s position as the number one world-wide within the various market sectors it serves. well as excellent resale values. 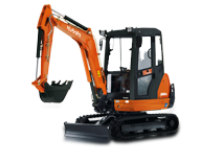 Since the development of its first mini excavator in 1974, Kubota has been extending the limits of design and technology in the production of equipment incorporating optimum economy, environmental awareness, ease of operation and functionality. Utilising the same technology as Kubota's world renowned tractors, the rugged, versatile RTV900 all terrain utility vehicle delivers outstanding performance for an exceptional drive, whether work or pleasure. Continued model development and growth has seen the KX Series expand into a formidable line-up of machines capable of handling the toughest of tasks on the most difficult of terrains.